Would You Buy a “Dynamic” Keyboard? Envisioning an e-ink keyboard that changes with your whims. When you look at your keyboard, do you ever feel that it’s just a little too… static? Me either, but I’m still intrigued by this concept from designers Maxim Mezentsev & Aleksander Suhih (presented at the site Yanko Design, then spotted by Gizmodo). 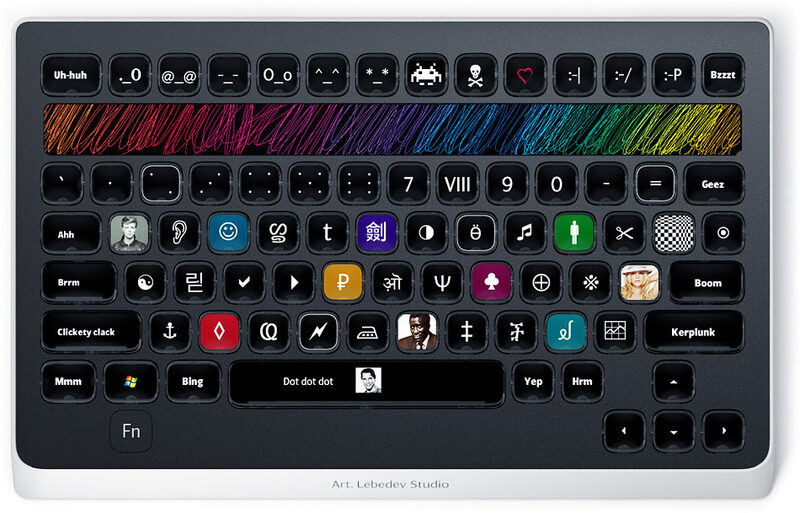 Basically, it’s a keyboard whose keys are themselves screens–e-ink screens, specifically. It could be a boon for bilingual people everywhere. Mezentsev and Suhih’s concept is just that for now–a concept. But believe it or not, something like this has already been done before. I have a longstanding interest in keyboard innovation (see “In Search of the Perfect Keyboard”), but not even I was aware of the fancy keyboard dreamed up by Artemy Lebedev and his studio. Years back, Art Lebedev created a keyboard called Optimus, which has been made in a few varieties. The Optimus Maximus, for instance, on top of sounding like a Transformer, itself can transform into a keyboard to suit any language–“Cyrillic, Ancient Greek, Georgian, Arabic, Quenya, hiragana, etc….and so on into infinity.” The gizmo features 113 OLED displays, with a frame rate of 10 frames per second. To reduce wear and tear, the screens themselves are embedded within the key structure, so that you’re only pressing on a key’s transparent cap. Software called the Optimus Configurator helps you layout your trippy keyboard to your liking. Clicking through the Art Lebedev site induces a sort of giddiness. The bi- and trilingual will of course benefit from such a device, but so will video editors, designers, or any users of specialized software who aren’t so good at memorizing keyboard shortcuts. One image on the site presents a suite of ten keys off to the left, featuring the icons of various applications or services: Gmail, Firefox, YouTube, MS Word. You can have one key show you the weather. You can have another one display words and their definitions. You begin to realize that when your keyboard is also a programmable screen–or a series of 113 of them–that your keyboard becomes something like the homescreen of your smartphone, or the desktop of your computer. It becomes a kind of command center, or dashboard, in a way only limited by your imagination. The Maximus model, which launched in 2007, appears to be currently unavailable, per Art Lebedev’s site, but you can order a newer, similar model, the Optimus Popularis, released December of 2011. It’s a little more compact than the original Optimus offering, and uses LCD rather than OLED for the keys displays. It will run you $1,086, though, so it’s not for the dilettante. Before you shell out that kind of dough, you’d better have a compelling reason to switch from QWERTY to the not-yet-popularized alternative, Bowie-Ear-Smiley.